The ferry to Tallinn, the Capital of Estonia, leaves from Helsinki and the 2 hour journey across the Baltic is over even before the ship's bars and restaurants have been explored. Travelling to Estonia by sea is very popular with tourists and no wonder, as Tallinn is the closest capital to Helsinki and travelling by ship enables you to combine the fun of cruising with efficient transportation.Estonia is a top destination for tourists in the Baltic region and Tallinn the most visited tourist place. The roof top deck or sun deck is for adventure.The wind is extremely strong because of some strange fluid dynamics and one has to almost struggle to walk against the wind i.e towards to bows.It is common for scarves and mufflers to be just blown away.Maybe it is the Baltic wind.The whole sun deck area is protected from the wind by glass partitions.There is also a bar here. designed to cross the sea in about two hours year-round, offering amenities and public rooms to passengers that are almost the same as those found on cruise ships. The boarding terminal is huge and there were about 2000 passengers travelling with us. When the boarding started it was pretty congested and we could see cars also entering the hold of the ship. The process took about an hour. The main feature of the interior design of the ship is the show-bar located in the fore of the ship going through three floors and having a large glass wall. Passengers can also visit and enjoy themselves in the many restaurants and cafes on board which include an Ala carte restaurant, two buffet-restaurants, a pizza-restaurant, hamburger-cafe, ice-cream corner for children, children’s play corner, sun-deck bar, a casino and business lounge. In the stern there is a bar going through two floors and having a glass wall. On board M/S Superstar one can also find large shops which sell everything from groceries, alcohol, latest cosmetics, clothes, fashion accessories and much, much more. Tallinn, which is the capital of Estonia, is situated on the northern coast of Estonia and on the chasm of Finland. 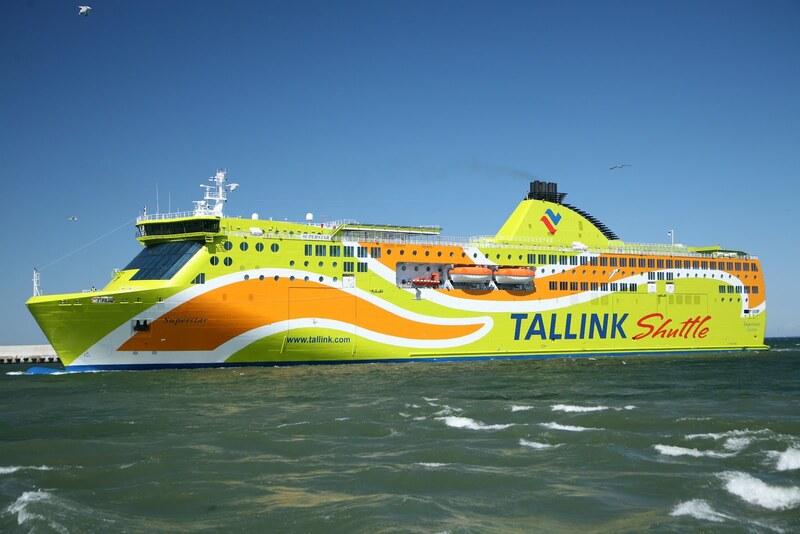 The Tallinn Ferry Port is one of the biggest ports for both passenger and cargo in Estonia. Due to the fast development of this Ferry port, it is very popular among the surrounding areas of the Baltic region. This port is located very close to the old medieval town. It has four terminals. Built up from the 13th to 16th centuries, when Tallinn – or Reval as it was known then – is an enclosed neighbourhood of colourful, gabled houses, half-hidden courtyards and grandiose churches is, quite rightly, the city's biggest tourist draw. And the fact that it's all neatly packaged within a mostly-intact city wall and dotted with guard towers gives it an extra dose of fairytale charm. This spectacular, onion-domed structure Estonia's main Russian Orthodox cathedral. The church was built in 1900 by the Russians when Estonia was under Czarist rule.An architectural masterpiece , the building is also the grandest and most opulent church in Tallinn.The interior, filled with mosaics and icons, is well worth a visit.The church's towers hold Tallinn's most powerful church bell ensemble, consisting of 11 bells, including the largest in Tallinn, weighing 15 tonnes. You can hear the entire ensemble playing before each service. The old town is a tourist attraction and attempts have been made to recreate the atmosphere of the medieval times. The Coke Vendors go around wearing traditional uniforms belonging to the era.The Cappuchino sellers are also attempting to recreate the atmosphere of the medieval times. We went to Mcdonlads for lunch and ran into a problem. The only cash accepted was Kroner and we had only Euro. The credit cards needed the pin number to be punched in the machine and even one out of us did not remember their PIN.We had to stand in a long que to change the money at the money exchanger(at a big loss). After this incident all of got new PINs and memorozed them as well as stored them on our mobiles. Medieval Lamposts and Souvenir Outlet. There was a souvenir shop selling semi precious orange stones and other items. One of the interesting items on sale was the suit of armour worn by Estonian Knights.When I showed some curious interest in the armour suit the sales person determinedly tried really hard to make me buy it.She assured me it was fully wearable with excellent joints, extremely comfortable and would afford full protection(against what?-but did not ask). She was willing to give a whopping 50% discount on the list price of 3000 Euro. I escaped by saying that I would look around and come back later. The picturesque Town Hall Square has been the undisputed hub of Old Town for the last eight centuries Surrounded by elaborate merchant houses and packed with café tables, it's a natural magnet for tourists. Historically it served as a market and meeting place, and was the place where executions took place. We sat at one of the cafe tables for half an hour and tried to imagine the 15th century scene where there was no Capuchino, coke, Laptops, horses in place of cars, beer being consumed in wooden mugs etc. with the Burgermeisters in their colorful attire entering and exiting the town hall.The weather vane atop the spire of the Town Hall is the original one put up in 1404. The Tallinn old town has been declared a UNESCO World Heritage ite. Estonia is one of the 10 top digitised cities in the world where IT is used for almost very thing.Free wi fi was available all over the Old Town. The Estonian language has 9 vowels against 5 in English.The higher number of vowels give a musical lilt to the language and singing comes naturally to Estonians. In 1989 , to free themselves from the Soviet rule , the Estonians launched a singing revolution in which 2 million people held hands and sang patriotic songs banned by the Soviet Union.The USSR finally gave up and allowed Estonia to be free making it the only nation which Sang It's Way To Freedom. With the KGB gone, the Estonians worked hard for 20 years and have made their country most advanced in terms of adoption of Information Technology and modern architecture.In 2011 Tallinn was the European Capital of Culture. When visiting India stay in our Airbnb Reunite in Delhi. It can host a group of upto 8 guests.